Norwalk Detectives are seeking the public's help in identifying two armed robbery suspects from a Chevron Gas station in La Mirada. Crime Summary: The two suspects entered the location, one carrying a handgun, another carrying a shotgun. 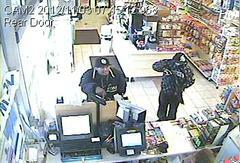 The suspect with the handgun ordered the employee to open the cash register. 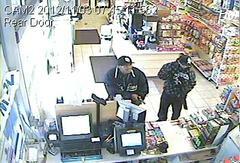 Both suspects grabbed miscellaneous food and cigarettes before leaving. Contact: OSS Detective Munoz, (562) 863-8711, Refer to File 912-15485-0470-033.